How can a child be fearful of a playroom? Why would a room filled with colours and toys and other children be so terrifying? How is it that a child could be so avoidant of a room literally designed only for the purpose of playing? If you stop to think about it, it’s not that strange. There are children everywhere who are fearful or shy away from new experiences and a room full of people. There are tons of kids who hide behind their parents’ legs when someone kneels down to introduce themselves. 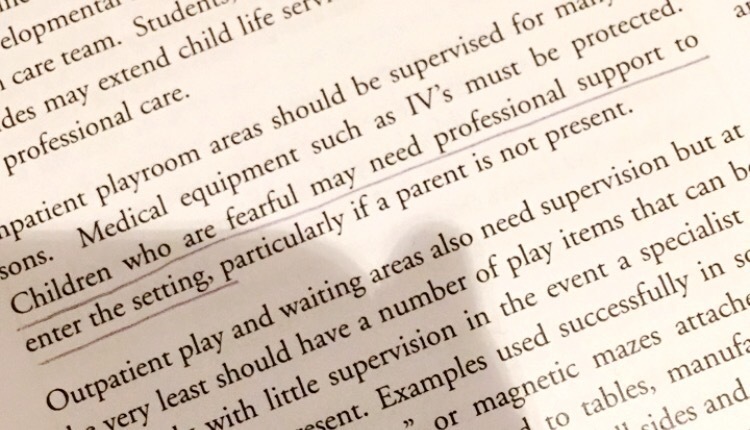 Those children may be initially nervous to enter a playroom. But some children are afraid, nervous, or anxious for other reasons than being naturally timid. When I volunteered in child life last year I worked briefly with a young girl – she was the 3 year old sibling of a baby on the inpatient floor, and she was adorable. She was a tad quiet at first but still smiled and told me her name when I asked…she grabbed my hand and wanted to be friends almost immediately after. This little girl was not shy to talk to people in the hallways, or roam and explore but when it came time to pick up art supplies from the play room she froze. The room had a handful of parents and children’s in it, all seated, chatting, and working on the daily activity. She refused to cross through the doorway to go in to the play room, and hid around the corner. At first I was shocked and confused. How could it be that this rambunctious little girl refused to enter a room designed for fun? I didn’t ask her why – I could tell she was uncomfortable – so I made it in to a game. I was the spy and I had to sneak in to the play room to retrieve our supplies without anyone seeing me. She was very excited to be working with a spy and encouraged me to go in and be quick. I clumsily “snuck” in to the room, and grabbed everything I needed, while dodging fake obstacles and traps. She watched with glee from the door as I collected the items (and some extras). I loudly whispered to her that it was too much for me to carry all at once and that I needed her help to complete the mission. I had no idea if my plan was going to work but thought it was worth a shot. Before I knew it she bolted in to the room grabbed a couple things from my arms and ran back out to the hall. Parents were staring at me with proud smirks that I was able to coax her in to the playroom – if only for a brief flash. Whether it was the excitement of the “mission”, the desire to help me, the eagerness to go do our craft, or a genuine overcoming of her fear, she confidently stepped in to the playroom and that was all that mattered.